For some people, early mornings can make or break the start of a day. Ever wonder what things you should do before 7 a.m. to give yourself the best advantage for the day ahead? We’re here to help. Getting up in the morning isn’t always an easy task, especially when living in the 21st century when things can get pretty busy. Life always seems to move so fast and time sometimes never seems on your side. With having a job, family, and other social obligations, there’s little space and time for ourselves, but what you do first thing in the morning has a great impact on how the rest of the day will go. 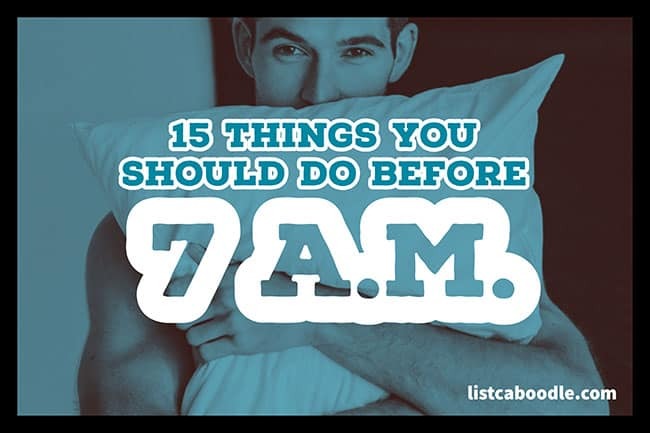 15 Things You Should Do Before 7 a.m. The start of your mornings shouldn’t begin abruptly – instead, you should have some time to easily and smoothly transition into your day. And while you probably can’t prevent every unfortunate a.m. situation that might come your way, the truth is, doing something you wouldn’t normally do almost guarantees you of having a more than normal day and a better grip on things. If you want to have consistently great days, here are 15 things you can do before 7 a.m. so that you can approach your day mindfully and optimally and also build a good daily foundation. Getting a late start only leads to morning stress. If you wake up with time to spare in the mornings, you should have a morning routine. You can start your day on the right note by setting your alarm 5-10 minutes earlier each day for you to get ready while also doing the things that will promote a positive mindset. Use a real alarm clock. Don’t use your phone or tablet to wake you up because they can easily be snoozed and also forces you to check your emails and social media. Getting enough sun exposure is vital for our health, so why not be like our ancestors who rose with it? Starting your day with direct sun exposure will not only improve your mood, give you greater energy and concentration, but once the day is over and you’re ready to be off to bed, doing this will also allow you to get a better good night’s rest. Take out 10-15 minutes every day in the early morning; trust us, it will make all the difference. A little meditation never hurt anybody. If you’re having trouble tuning out all of your worries, getting up in the morning and practicing taking your focus off of work and other stresses allows you to quiet your thoughts, center yourself, and prepare your mind, body and soul for the day ahead. In essence, meditation gives people the chance to detach from the modern world we live in today to enter a place of utter tranquility and peace. The benefits of stretching are nearly endless. Setting aside 5- 10 minutes to get your limbs loose in the morning awakens our entire bodies, including our bones and joints, along with our minds. After waking up in the morning, our muscles usually feel stiff and tight, so stretching them out helps to relieve the tension and also relax so we can better prepare for the day ahead. If you don’t know how and where to start, there are plenty of tutorials on YouTube you can choose from to suit you best for daily practice. It’s no question that music is valuable in all aspects of development. It can help improve mood, concentration and performance, and much more! Turn on some music that contains a positive message to get you inspired to help pump you up for the day. Even listening to relaxing, meditative music while you stretch or get ready can also be really helpful to get things going. You probably know how essential water is to our overall health. It turns out, drinking water is one of the most important things you should do before 7 a.m.
Water is no doubt one the greatest ways to wake up your body and kick start your metabolism. Instead of reaching for that cup of joe, when you wake up in the morning, go for at least one liter of water and also add in some cut lemons. This not only activates your digestive system but it also helps clear out toxins in the body. Too many people also suffer from dehydration so, sure to bring a reusable bottle with you wherever you go so you can keep hydrated and get the nutrients you need. If you’re a busy morning person, chances are, eating is the last thing on your mind. However, skipping breakfast can be a huge mistake and it’s important to keep in mind that breakfast is the most important meal of the day! In terms of the day’s productivity, a good breakfast fights the mid-morning hunger and provides enough protein and carbs for energy to get you started. Skip the empty, sugary calories of unhealthy snacks and make no regret by opting for a healthy smoothie, fruits, veggies, or a bowl of oatmeal to keep you energized throughout the day. A great way to get the morning going is by exercising, so move that body! It’s important to take care of yourself physically. Whether you’re taking a brisk job outdoors, early bike ride, or walking your pet, exercising will not only make you feel good, but studies suggest that it can improve cognitive function. Getting your blood pumping early will make you feel more alert, focused, and ready to tackle whatever the day brings your way. You don’t need to write in some diary or journal to do have a calmer, clearer outlook on life, but remember that your subconscious is always listening to everything. In today’s society, often it seems far too easy to fall into the terrible habit of complaining about everything that’s happening in our lives. Instead of draining your energy with negativity, counter it with expressing gratitude, whether whispering or to the top of your lungs. And no matter how you express your thanks, you will be able to get your day started on a positive note, and set the stage for a productive, happy day ahead. Saying positive affirmations or mantras aloud or in your own head can help you get your mind on the right track and focused on your day’s goals. Negative thinking is common, but shouldn’t be a normal part of your everyday. You can change your mind through intention and habit, using affirmations as the tool to guide you to more productive, healthy thinking. You can find a few ideas for morning affirmations most anywhere online to help you get into the routine of positive self-talk. A clean space makes for a clean mind. When you wake up early, you may or may not have some time to attend to tasks that can take up a valuable amount of time at the start of your day. But it doesn’t have to be this way if you keep things tidy. Yes, everyone has things that they have to do, but if you just take a few minutes to clean, unclutter, and organize your personal space, you’ll feel more prepared for your day. It’s a small change that can have a big impact on your life, just give it a try. Social is the cause of the death of productivity. We know that it’s hard, but you should avoid getting all wrapped up in what’s going on on social media. That is, unless you’re using social media for inspiration, or some other benefit. If not, try to avoid it at all costs before starting your day or you’ll risk the chance of falling into the abyss of no return. Truly, there isn’t any other feeling more rewarding than having a completely crossed-off checklist. We all procrastinate, maybe some more than others, but prioritizing your tasks can set out your activities in a way that actually makes sense. In the morning, you’re in a super energized and refreshed state., so start the day off on the right foot by not only creating a to-do list, but seeing about which ones you’d like to tackle once your day starts. Not only will you have the sense of accomplishment at having completed that task, but the list of task won’t be looming ahead and causing you to worry all day. A touch of inspiration can help open up your mind for creativity. We believe that there is never a point at which you’ve learned “enough” and to truly be successful in the long run, one should make a lifelong commitment to learning. Every day, make a point of spending some early a.m. time in the morning to learn something you wish to know more about or something totally new. You never know what might give you your next great idea. There’s a science to achieving goals, so forget yesterday, focus on today. If you want a really awesome day, you should always remind yourself why you’re here and what you wish to do. Whether short term and long term, taking just a few minutes to review your goals to really put your day into perspective. Think about what would happen if you added this into your daily routine to read them every single day. You will more than likely start to spend your days working toward them, and for certain, they’ll manifest. There’s no confusion or ambiguity to it! Make your day the best it can be by trying these “15 things you should do before 7 a.m.” Changing just a few things in your morning routine can pay big dividends throughout the day. You’ll feel better, be more relaxed and improve your mindset—no matter what the day has to offer or challenges you’ll face.